From left: Sandra Leong, general counsel of Bristol-Myers Squibb (presenter to Huber), Huber, Iyer, and Sreenivasan. 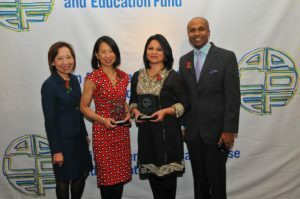 Civil rights attorney and author Deepa Iyer was awarded the 2017 Justice in Action Award by the Asian American Legal Defense and Education Fund on March 2, during the organization’s annual gala at Pier Sixty, Chelsea Piers, in New York City. The Justice in Action Awards are presented annually to individuals for their outstanding achievements and their contributions in promoting justice and equality. The other recipient was Marie Oh Huber, general counsel of eBay Inc. The event was emceed by NYC Chief Digital Officer Sree Sreenivasan.